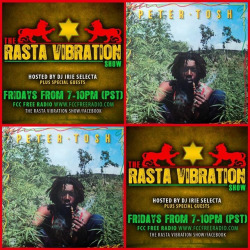 Tonight on The Rasta Vibration Show, We have guest Kabaka Pyramid giving us a call to discuss what we should be looking out for when it comes to his music & tour dates. And nuff reggae music to get you thru the night! Tune inn tonight!!! 7-10pm(pst) worldwide on www.fccfreeradio.com Studio 1A… Big up!! !